Founded in 1989, the Legends Soccer Club organization started in Kansas City and now has sister clubs throughout the nation. The hallmark of all Legends teams is superb individual skill, notably deceptive dribbling and goal scoring. Founder, Andy Barney (A License-Advanced National Diploma) is the author of "Training Soccer Legends" (a 320-page book that documents the unique Legends training philosophy) and "Legends for Life" (A 230-page book describing why the Legends provides modern society's best character training). Andy has also authored "Legendary 1 v 1 Moves", a DVD that describes the in-depth methods of training the world's most effective dribbling moves and "Training Legendary 1 v 1 Moves" detailing the best training progressions for teaching deceptive dribbling. Development of the individual player is highly emphasized over team success because winning is the natural consequence of maximizing each individual player's potential. The Legends Club has an Academy teaching world class dribbling and finishing skills to better prepare players for the highest level of play. Since the inception of the Legends club teams with a majority of Legends trained players have won over 50 Kansas & Missouri State championships, placed 5 times in the USYSA National Championship Final Four (winning once), won 14 National Indoor Championships plus numerous other prestigious national tournaments. Often the captains/leaders of their high school soccer teams and perennial State Select players, nearly 400 alumni have played in college, 56 have received National or All-Conference selection and 40 have been drafted to play professionally (Including Ryan Raybould of the KC Wizards). Four have played at the National team level. However, the real value of Legends training is courageous, creative, leadership character for life. Many long-term Legends players are creative leaders and mentors early in their career. They and their parents are convinced the "out of the box" Legends creative training was a major influence on their leadership capabilities. Andy was born in Oxford, England. He was brought up in a soccer family with two generations of professional play. Andy was a registered semi-professional player with Oxford at age 16. From ages 16-23 Andy worked full-time in business while playing for various English clubs. He became a Branch Sales Manager for a large office equipment company at age 20. At age 23 Andy left the business world to study Physical Education. From1981-1984 he was an ever present first XI player with the British Collegiate team. He graduated with honors in Physical education at age 26. Before moving to America he coached British youth soccer teams for ten years and lectured in Physical Education. After emigrating to the U.S. he founded British Soccer Camps, the world’s largest soccer camp organization. From age 27 to 32 he served as Director of Coaching for the Kansas Soccer Association, Mid-West Girls Regional Director of Coaching and the USSF as a U19 National Staff Coach/Selector. He simultaneously worked as Director of Marketing and Coaching for All American Indoor Sports, a KC based multi-million dollar indoor soccer and sports mall organization. Andy founded and ran the National Indoor Soccer Council before handing the reins to the USISA. He is currently a member of the US Indoor Soccer Association’s Advisory Board. He coached men’s college soccer at Avila University, is an NSCAA Convention clinician and is currently in his 21st year as Director of Coaching for the Kansas City Legends Soccer Club. Andy holds a United States Soccer Federation “A License” an NSCAA “Advanced National Diploma” and 14 coaching qualifications in 8 other sports. 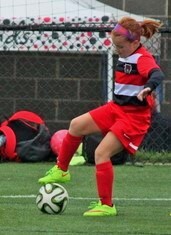 Andy’s Legends club teams have won 13 National Indoor Championships & 3 USYSA Regional Championships. In 2002 a team with ten of Andy’s former U18 players, beat Southern California 9-1 in the final four en route to winning the U20 National Outdoor Championship. Andy is the owner of Soccer Excellence Inc., the K.C. Legends Soccer Club, National Indoor Soccer Championship, SuperClubs North America, the SuperClubs National Team Tours and the National HappyFeet Preschool & Legends Soccer Club franchise system. Andy is the author of “Training Soccer Legends” a 320 page book with a unique deceptive dribbling and goal scoring individual perspective on youth coaching. Andy has produced two best selling DVD’s, “Legendary 1 v 1 Moves” & “Training Legendary 1 v 1 Moves”. He is currently writing his second book “Legends for Life”. Andy plans to write a third book "Geneticism and Discrimination in Youth Soccer". Andy has a vision and mission to develop all children into brave, creative leaders for life through soccer.